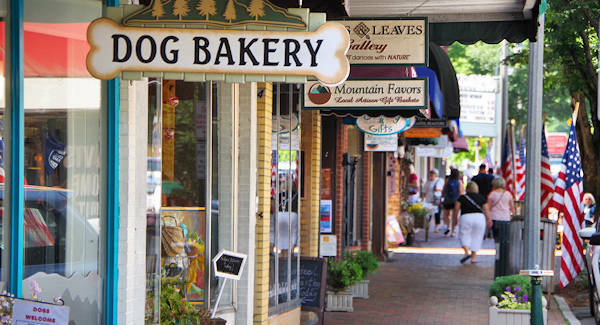 About 25 miles from Asheville is the hopping small town of Waynesville. Its busy downtown has a surprising number of fine galleries and specialty shops. There are many things to do and special events to enjoy. Along with the popular Mast General Store, there are about a dozen galleries and a variety of antique shops, home furnishing centers and gift shops. And don't forget the many restaurants and a couple of breweries. 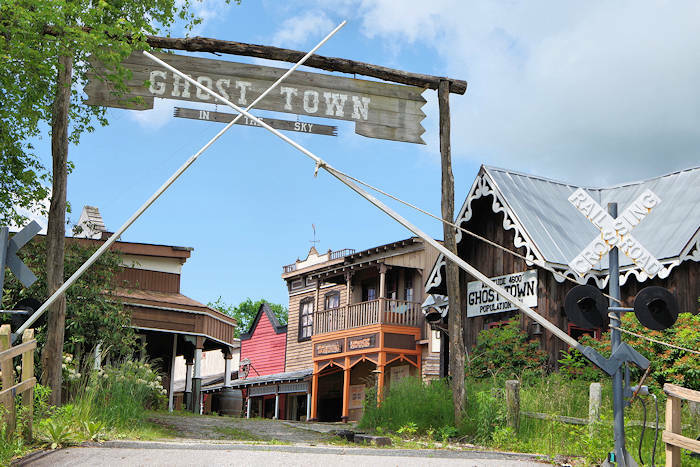 Waynesville is Haywood County's biggest town with about 10,000 residents (and it's the largest NC town west of Asheville). It's been a favorite mountain retreat since the early 1800s. Even before the railroad made it easy to get here, visitors flocked to Waynesville for the cool, clean air and water, outstanding scenery and an opportunity to escape sweltering cities. Nearby outdoor adventures are limitless since it's located at the foot of the Great Smoky Mountains and near the Blue Ridge Parkway. 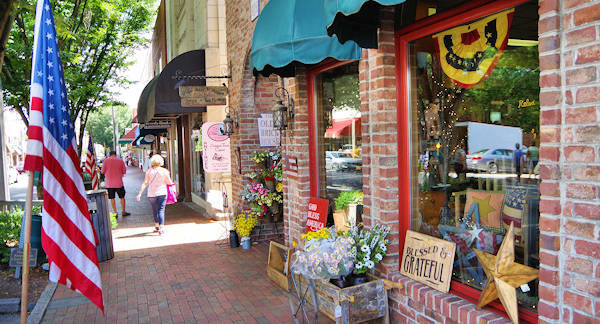 Downtown Waynesville's restored historic buildings and brick sidewalks create a browser's paradise. Find plenty of free parking, including along Wall Street that runs parallel to Main Street, city lots and a parking deck at 143 Branner Avenue. From bakery goods for dogs and their owners to innovative cuisine, find plenty of local food and fun places to eat. Leap Frog Tours in downtown Waynesville offers custom tours and area transportation to explore the many different aspects, from beer to art and everything in between. 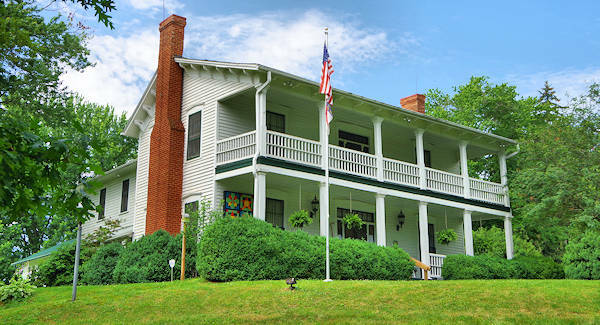 Nestled between Main Street and the Richardson River in Waynesville is the Historic Frog Level neighborhood. Find a variety of shops and the Frog Level Brewing Company (56 Commerce Street). The Museum of North Carolina Handicrafts is housed in the historic Shelton House (49 Shelton Street). Take a fascinating one-hour tour of the distinctive art, handicrafts and furniture created by North Carolina artists. Read more. Adjacent to the Shelton House is the acclaimed HART Theatre, a semi-professional community theatre with a great line-up of Broadway shows, concerts and more year-round. Folkmoot U.S.A. is a 10-day celebration of world dance and music with visiting international groups performing at many events in July (see our Folkmoot Guide). On four Friday nights in the summer, come down for the Mountain Street Dances. Put on your cloggin’ & square dancin’ shoes and enjoy an old-fashioned mountain hoedown in front of the Historic Courthouse. 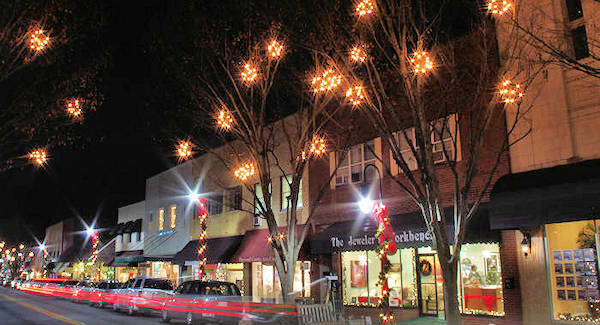 During the Christmas season, downtown has plenty of extra events especially the first two weekends of December. Directions to Waynesville from Asheville: Take I-40 West to exit 27 onto Hwy 74. It's an easy 30-minute drive. Waterfalls include Soco Falls, Skinny Dip Falls and Sunburst Falls. 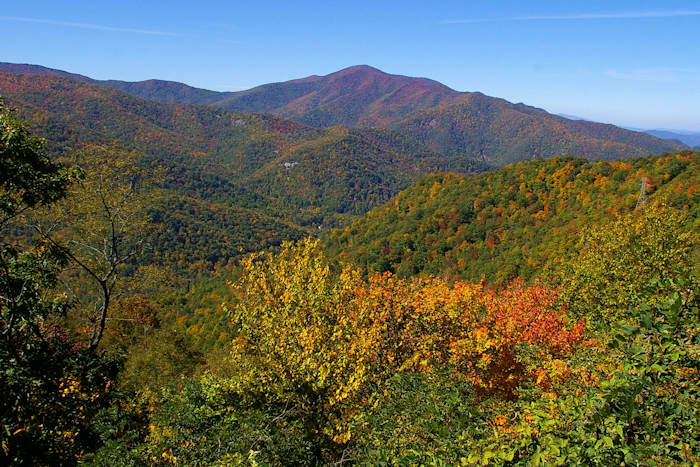 Hikes include Graveyard Fields, Max Patch, Cold Mountain, Black Balsam Knob and Purchase Knob. 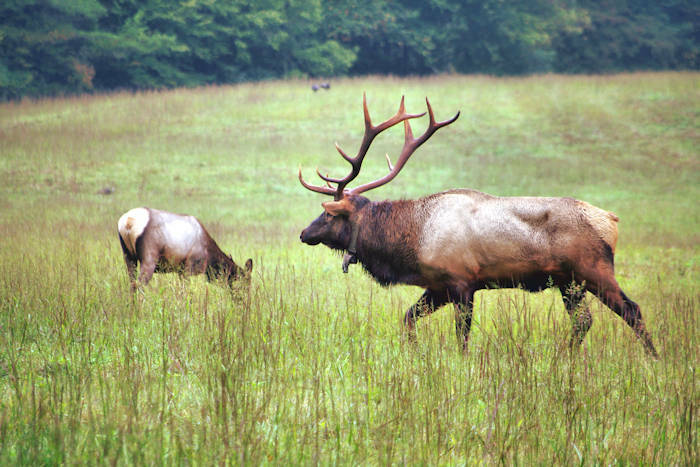 The scenic Cataloochee Valley area of the Great Smoky Mountains includes the famous elk, historic buildings, camping and hiking. 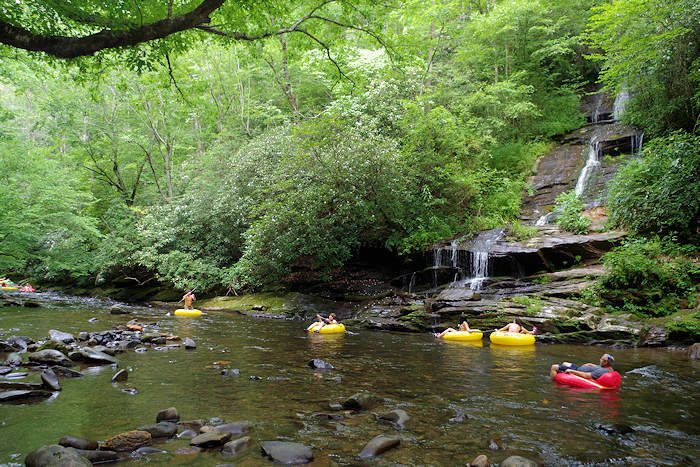 The Pigeon River area of the Great Smokies has ziplines, whitewater rafting and more. Top scenic drives include the Appalachian Medley Byway and Forest Heritage National Byway. Go to the Haywood County NC Smokies website for more. 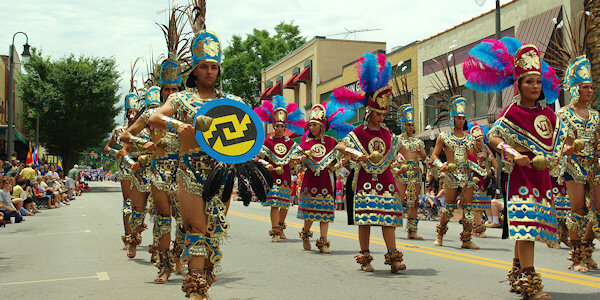 The world comes to our mountains for NC's Official International Festival with visiting dancers and musicians from many countries, big street festival, performances, parade and more in Waynesville, Asheville and nearby towns. First Fridays May-December: "ART after DARK" with galleries & studios open until 9 PM with special artists showings, displays and refreshments. Look for the WGA group flag representing the Waynesville Gallery Association. More: Go to Waynesville's website.